Page level Tracing takes the precedence over the Application Level tracing. Lets start with creating new website. In web.config add following entries to enable Application level tracing below System.web element. pageOutput=”true” – add the tracing information at the bottom of the ASPX page. localOnly=”false” – tracing will be available to any web page. 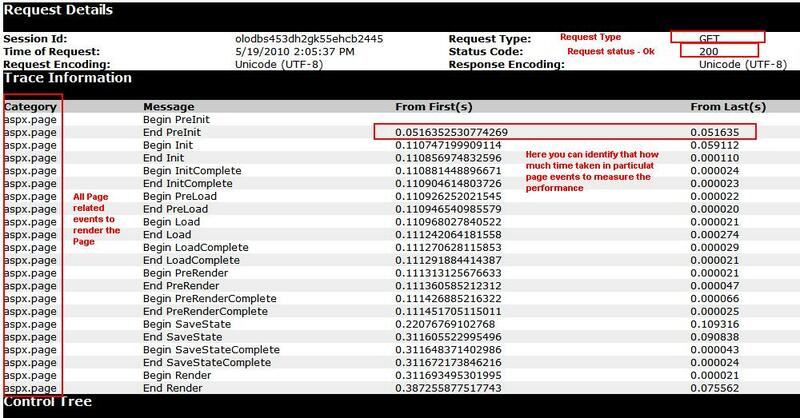 requestLimit=”10″ – How many request should be saved on the server. mostRecent=”true” – whether or not display the recent tracing information if the request reach at the limit. Here you can see much of informations displayed like SessionId, Request Status, Controls available on that page, All the events of the page with start and end time etc and thus you can figure out the performance of your web application. Create few controls like link button and view the page in browser. You will see that the page is displayed with no tracing information, although its turned ON in web.config but page level tracing has the precedence over application level tracing. Now on the click event of Link buttons write the custom trace information. when you will click on the WriteLink button, below output will be seen. and when you will click on warn button, the message will be displayed in Red color. so it is suggested to display the the important trace message as a warn. Create a new class file and write a static function which will write the Trace Message. You will notice that Trace object is not available by default like ASPX page instead you will need to import the package “System.Diagnostics”. So, there is lot difference in System.Diagnostic.Trace and Page.Trace. Trace from Diagnostics display the trace information in output window of Visual studio whereas the Trace from page displays the Trace information in ASPX Page. We will need to add the listener in web.config file to route all the tracing information to the single web page. To integrate the System.Diagnostics Trace with ASPX page, write below line of code in web.config. This file contains all the information about the tracing of the application. To view the trace information just write the file name and you will get page which will look like below snap. .NET has provided us the flexibility of writing our own Trace Listeners in the form of the TraceListener class. Every Trace Listener is inherited from this class; therefore, in order to implement your own Trace Listener, you must inherit your Trace Listener class from this class. TraceListener class has many virtual and abstract methods; at the very least, each inheritor of this class must implement the Write and WriteLine methods; other important methods are Fail, Close, and Flush. Inheritors are not supposed to implement these methods but it is a good idea to implement these methods. Descriptions of these methods are given in the beginning of the article. Fail Outputs the specified text with the Call Stack. For this article, I have created a Trace Listener, DatabaseTraceListener, which actually stores trace and debug messages into a database. add below code in Web.config which stores the connection string information. DetailedErrorDescription column contains the detailed error message which will be passed in second parameter of the Fail method. Now create a class named “DatabaseTraceListener” which inherit the abstract class “TraceListener”. You can check the code snippets in Source code of this article. if you want to implement your own Trace Listener, simply derive your listener class from TraceListener class, implement at least the Write and WriteLine methods and you are done. In our Example, Flush and Close methods simply save all the cached messages into the database. We can also save the trace information in log files. please send me the link for the Code(Tracing ASP.NET Website). Thanks in advance.